Elizabeth Eulberg is one of my favorite YA contemporary romance authors. Better Off Friends is the kind of book that I've come to expect from Eulberg. Sweet, light, fluffy, engaging characters with a happy ending. Our leading man and lady, Levi and Macallan are both nice kids, the kind of characters you root for. Levi is the friendly, outgoing, athletic type. He is the type that wants to fit in and can be a bit too swayed by peer pressure of fitting in with "the guys." Macallan holds things closer to her chest. Her mother's death when she was 11 forced her to grow up fast. But she's not a withering flower. She speaks her mind and even the toughest guys don't scare her off. When Levi and Macallan are together, there is endless banter. Good-spirited teasing, inside jokes, television quotes. It's hard to be in their presence because you quickly feel like a third wheel. The ultimate question of this novel is whether boys and girls can be "just friends." The answer the book presents is essentially "Ehhhh...not really." At least not easily. Macallan and Levi maintain a pure friendship for years. Dating other people, having separate friends while being as close as siblings. Then things get more complicated. One develops feelings that the other doesn't share. Awkwardness, jealousy - about what you'd expect. It ends up feeling pretty predictable. I don't necessarily mind that, although I do enjoy being surprised. With this kind of book, I usually want the story to take the happy, predictable path I expect. The pacing of the novel falls at times. It takes place over the course of about four years. I enjoyed getting to see Macallan and Levi grow up, but this long time period makes the plot occasionally drag. It's told between the alternating points of view of Levi and Macallan, which I really liked. There are also little asides by the two of them which makes it seem like they are recounting the story to us. So we know going in that they remain at least friends at the end (not that you'd expect otherwise). Each time the point of view changes, there is a little swing with either a girl or a boy on it to indicate who will be telling the story. I thought that was a really cute and clear way to distinguish the characters. 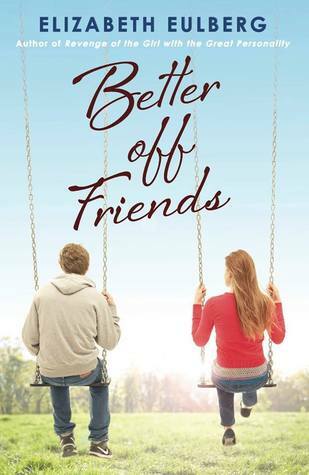 Better Off Friends is a fun, lighthearted romance. It's not my favorite Elizabeth Eulberg book (that would be Prom & Prejudice), but it's well worth picking up. Anyone who enjoys likeable characters, romantic tension, good banter, and general fluff will love this book. I want to read this author! I've looked at her books time and again and just can't pick which one to start with... Prom and Prejudice sounds really good, but this premise is right up my alley with the best friends to lovers theme. Anyway, nice review! Sounds like a good beach read! Definitely nothing wrong with fluffy, fun reads with HEAs! The pacing seems strange, though. Over four years? That's a long time in a YA! This sounds good. I read one of her other books, and really liked it. Might have to pick this one up too. Great review. I always like the sound of the books by this author but they don't work for me. I don't know why. I know they are popular with my teens so I keep talking about them. I just finished reading this one and agree with your review :) I thought it was cute. This book sounds like it had some good life lessons to take in, Nice review!